This is a MFC transparent CSliderCtrl class, as it uses CSliderCtrl as its base class it can be used as a replacement class for any CSliderCtrl object. Tic marks are fully supported as can be seen in the screen shot above. To use, add this class to your project. 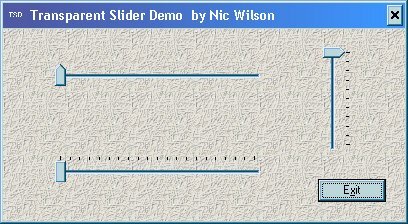 Add your sliders to your project normally, then change the CSliderCtrl type in your .h file to CMySliderControl and #include the MySliderControl.h file. Once compiled your sliders will be transparent and if you have auto tics set then these too will show.